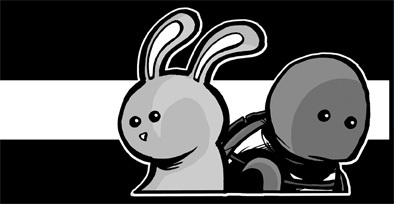 Turtle Vs. Bunny is an interactive comic where you, the reader, decides what happens next! The comic starts on January 16, 2007 and will run twice a week for three months. Between update periods, using a unique system of finger counting and antique abacuses, we will tally the votes for Turtle and Bunny. Whoever has the most votes within that update period will best the other character in that comic. So how do you vote? You can show your support a number of ways. By selecting either the Turtle or Bunny in the panel to the right, one point will go towards that character. If you stay neutral, no points will be awarded. If you send in either a pinup featuring the character or a photo of you or someone you know wearing either shirt, five points will be awarded. Finally, if you purchase a t-shirt of either character any time during the update period, 20 points will be awarded. So be sure you visit the site early and often to make sure your favorite character wins the race!